Dr. Ion Goldbloom is one of the weekly Celestial Tournament Opponents. His pets are Screamer, Chaos, and Trike. This throwback from Jurassic WoW is about go down! Your Team: Emerald Whelpling, Son of Animus, and Emerald Proto-whelp. Remember, these guys like to switch alot. Let the battle begin! Screamer is a Flying. He's going to start with Lift-off, so just use Tranquility. When his Lift-off resolves, counter with Moonfire. He will Alpha Strike next so Emerald Bite in return. He will use Feign Death as he is so low and bring in the direhorn, so either use tranquility again or switch to Son of Animus. 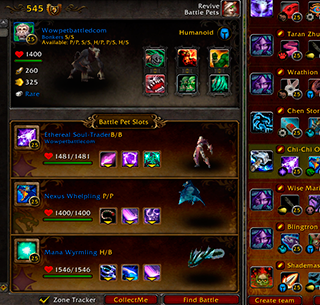 These pet trainers swap alot, its nice to see them being versatile in this expac, so when he swaps, switch to Son. Trike is Beast, but no match for Son of animus. Start with Extra Plating. He will try to stun you, return with Siphon Anima. From there its just Metal Fist spam with siphoon anima on CD, Animus will often win against this team alone without swapping. Chaos is Magical, and hits like a truck if you dont mitigate it. Either stay with animus and keep extra plating on CD or switch to the protowhelp and use Proto Strike, Either way you need to mitigate the incomming damage from his buffs. Animus can handle him, but proto is the way to go with his Ancient Blessing and Breath.